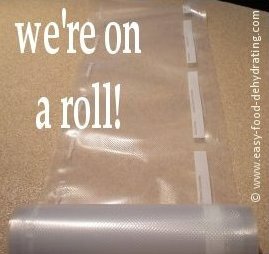 Vacuum Sealer Rolls - Make "Just The Right Size" Bags! Vacuum Sealer rolls are great for making "just the right-size" bags! Don't waste money buying a bunch of varying sizes of vacuum-sealer bags. Consider purchasing these in varying lengths, and widths, so make sure you don't get ones that are too wide for your particular machine. They make it very convenient when you have long-length foods that you want to store, such as spaghetti! No need to break the spaghetti in half to store! In fact, I left the spaghetti in its box ... just in case I forget how long to cook it :-) you know, different varieties have different cooking times! NOTE: I have noticed the white printed section (for you to write the bag's contents on) tends to 'come off' and stick to the lower heating element strip and the upper roller of the machine. Don't worry, this white residue wipes off very easily with a clean damp cloth. I wipe down the Foodsaver heating element strip immediately when I see the white powdery-stuff on it – so it doesn't hamper future bag sealings. It's good practice, anyway, to keep your roller and strip clean. You'll create a tight seal, and that's definitely what we're aiming for. You can easily get these at the same place you purchased your vacuum sealer machine from, or are easily ordered over the internet and shipped right to your door! Check out our picks from Amazon, near the bottom of the page. This just in from Nancy in NC: I get mine that are 11 inch by 16 feet and cut the material to make the size bag I want. I order directly from foodsaver.com and get the GAMESAVER brand, individually or the 6-pack. I asked the thickness and was told 4 mil, then I said they ought to include that bit of information in the item description. Right now, the bags are listed under "heavy duty". It's easy to create your own vacuum-sealer bags - just follow the three steps below. Take the time to cut across the width at a 90 degree angle! Cut off the desired length of bag at right angles, i.e. cut it STRAIGHT across at 90 degrees. If you keep the cut straight you'll have an easier time vacuuming it, not only that, you'll have rectangular bags and not odd misshapen parallelogram bags! Seal one end. Add your food to be vacuumed, along with an oxygen absorber. Vacuum and seal the custom-length bag! Write the contents on it too, and the date. NOTE: After vacuuming our bags, I pull out a 2ft length (approx.) of plastic wrap. I then wrap the package in it! This extra wrap takes care of sharp pointy corners, as is the case of me vacuuming the whole spaghetti box. Another good reason to use plastic wrap is if a vacuumed-bag seal gives way during storage, then the plastic wrap acts as an extra air- and water-tight layer! My real reason for using plastic wrap is to keep the bags from accidentally puncturing each other in the first place, when you are putting them in the Mylar bags for long-term storage. Follow the optional plastic wrap guide.